We always like to keep our eyes open for the occasional Google Doodle that appears on the Google home page, usually to mark an occasion or to commemorate a person. Today’s Google Doodle is in celebration of fencing at the London 2012 Olympics and with that in mind we thought readers might appreciate a roundup of fencing apps for both Android and iOS devices. We’ve already given you some suggestions for Olympic 2012 apps that you may want to check out and fencing is one of those sports that many of us only see when the Olympic Games is taking place. It’s not one of the most highly televised sports but does instill a huge amount of interest among viewers that soon become hooked on watching. 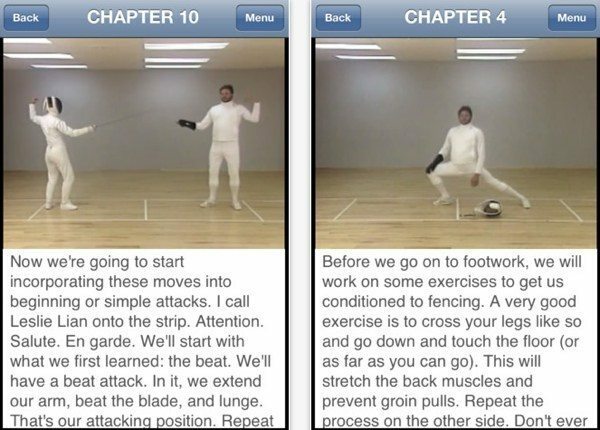 Whether you’re a novice to fencing or whether you’re already involved in the sport, the following apps should help you learn more or be useful for those who are already avid fencing enthusiasts. Fencing is a sport that requires mental discipline, agility, strength and speed so could be a great sport to get more involved with. Simply hit the links to be taken either to the iOS App Store or Google Play for Android. First off we have one of the best all-round apps for fencing at the Olympics with FIE Fencing. This is a free iOS app for iPhone, iPod touch and iPad running iOS 4.0 or later. It’s the official app from the International Fencing Federation and will give you all the info you need for following the fencing during the Olympics. It gives the results from individuals, teams, or under gender or weapon. All the news from the bouts will be available and you can be informed when the gold medals are awarded. It also has the calendar schedule and includes photos and videos and shows the Twitter account of the Federation. Secondly we have an iOS app called Fencing for Fun priced at $2.99, which is a great app for getting started and learning what fencing is all about. This is compatible for iPhone, iPod touch and iPad running iOS 3.2.1 or later. It includes step-by-step video lessons with an expert instructor that you follow along with showing the various techniques and it also has text instruction as you watch. Even if you don’t want to take up fencing yourself this is a helpful app to look at if you want to understand more about it as you view London 2012 fencing. It shows the basic moves, explains the equipment, contains a short history of fencing and also includes a demonstration of competitive fencing. If you fancy trying to keep score yourself as you watch then an Android app called Fencing Score Card will be useful. This is a free app and suitable for devices running Android 1.5 or later. 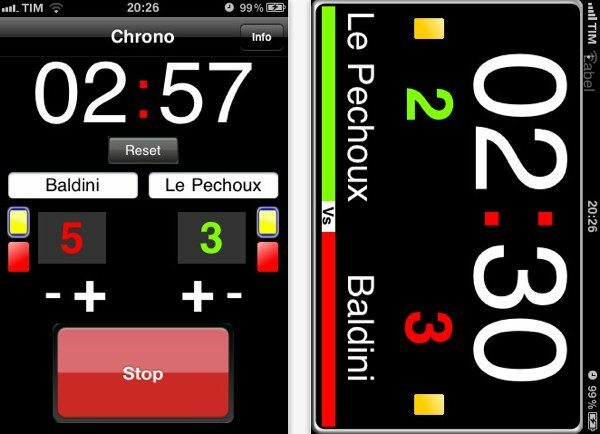 It enables the user to keep track of the scores and times during a bout and supports touches, penalty cards and tie priorities. An extra display mode allows you to show the last touch or card to others and there is optional sound and vibration for timer start, halt and running out. Meanwhile a free iOS app is also available called Fencing Aid — Free. This is compatible with iPhone, iPod touch and iPad running iOS 3.2 or later. 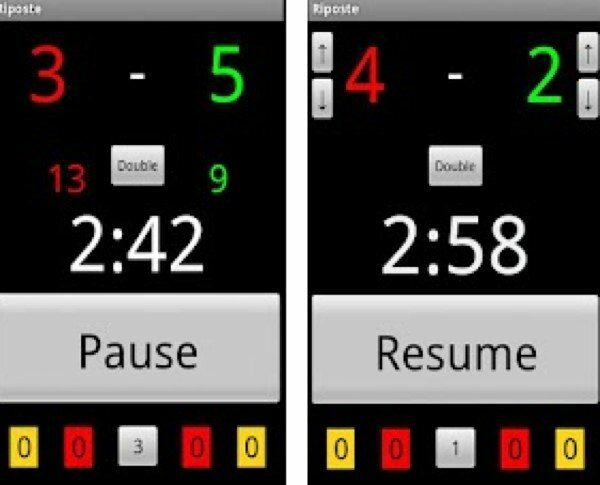 It contains many of the features of the previous Android app and has a timer, Scorecounter and Matchcount. It also contains full screen Yellow, Red or Black cards to show to the fencers and the Red card will automatically award a point to the other fencer. There’s also a Random Priority alert, a Medic alert, Landscape View and multitasking support. Finally we have another Android app in the form of Riposte for fencing referees. This is a free app and if you’re already involved in refereeing the sport of fencing, this may interest you. It keeps track of the score, time, period and cards and can be used for various types of bouts such as 5, 10, 15, team, best 2 of 3 and more. Settings can be customized and support includes automatic one- minute rests between periods, pause bout on score, fencers’ names displayed, beep and vibrate and more. Hopefully there should be something among these app choices that will suit everyone. We’d like to hear your thoughts on any of these apps so send your comments to let us know. Also if you have any other great fencing apps to recommend then share them with us by using the box below.